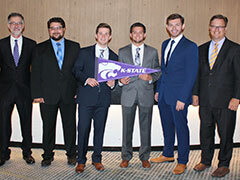 Four students from K-State’s College of Business Administration recently participated in the General Motors/Wayne State University Mike Ilitch School of Business Supply Chain Case Competition in Detroit. The event matched some of the best and brightest supply chain students from more than 20 universities around the world, including from Brazil, China, Mexico and Taiwan. The competition, hosted at the Renaissance Center in downtown Detroit, included a tour of Lear Corporation's Rochester Hills seating assembly operations center as well as "fun time" with a mixed-team bocce tournament at Palazzo di Bocce in Lake Orion, Michigan. On the final night, students enjoyed a dinner cruise on the Detroit Princess, complete with an awards ceremony, dessert and dancing. "What I enjoyed most with this experience was applying what I have learned in the past years in the Business School," said Alex Grey, senior in operations and supply chain management, Kansas City. International participants at the competition included Chang Gung University, Taiwan; Hangzhou Dianzi University, China; Tecnológico de Monterrey, Mexico; and the Sao Paulo School of Business Administration, Brazil. The event also included a dedicated career fair with General Motors recruiters and other competition sponsors, including Bose, Ryder, Denso, AIAG and Lear Corporation. "I enjoyed making connections with professionals as well as students in the supply chain field," said Lawson Roberts, senior in operations and supply chain management, Hutchinson. "The experience I gained was very valuable — from presentation skills/ideas, to the application of classroom learning, to real-world problems." The case, written by General Motors team members, focused on optimizing suppliers, warehouse/assembly locations, and supplier relations for the seating assembly of GM's truck division. Each team had six weeks to prepare and present a solution that balanced cost, quality, and supplier relationships. Teams that made it to the finals were given an additional "twist" in the case where a supplier's computer systems were hacked with ransomware and teams were expected to propose a remediation solution to GM executives/judges. Western Michigan University — the 2017 runner-up — walked away with the trophy this year. "I enjoyed the competition because it demonstrated the idea of a global business and the importance of diversity of thought," said Timothy Lillis, senior in operations and supply chain management and human resources, St. Marys. "Other schools provided new angles that gave a deeper perspective on supply chain." Attending a conference with supply chain faculty and students certainly had some unique moments. "At one point, the restaurant staff set up the lunch buffet in a way that originally only allowed for attendees to get food from one side of the table," said faculty advisor Brandon Savage. "Within five minutes, students and faculty had rearranged the table and serving dishes to 'minimize the bottleneck' and allow service from both sides of the tables. Yeah, we're nerds — but we got our food twice as fast!" Brock Steinert, senior in operations and supply chain management, Wichita, enjoyed spending time with students with similar interests. "I really enjoyed being able to make supply chain puns and not have people stare at me blankly," Steinert deadpanned. "The best part of the case was making the transition from education — what we have been learning for the last few years — to application, actually getting to use the knowledge in a real-world experience. Additionally, it was cool being able to see Lear’s manufacturing facility and see the processes and concepts we have been studying." Dan Minick, faculty advisor and instructor in the college concluded, "It's been rewarding to see some of the things that I do in class actually click with students, and see each of them apply that learning." K-State expects to participate again in 2019. Interested students can learn more about the Global Supply Chain Club at twitter.com/ksugscc.